What inspired the name Ritual Waters ? Home / Bathing / What inspired the name Ritual Waters ? Long Long Ago in a Galaxy Far Far Away……… sorry my Star Wars is showing. But really the start of Ritual Waters started actually with a tub or a dream of a tub like the one above. Have I mentioned that I like, no I LOVE baths? I love that quiet time where I can shut the door and prepare this space for me alone. 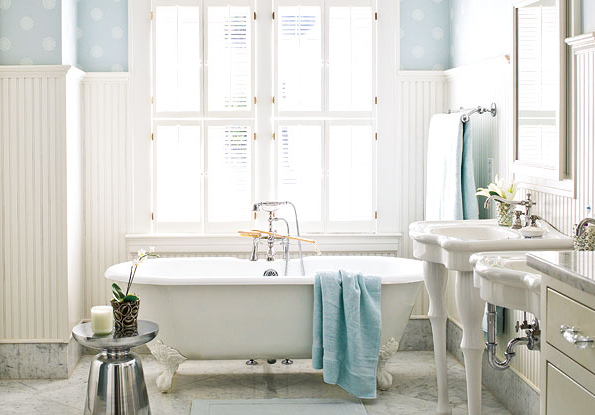 Where I can light a candle and sprinkle some yummy smelling bath salts into the warm, actually more like very warm water and ease my self into the tub. I unwind myself from the day’s stresses and just sit and be with myself. This ritual heals my spirit and I emerge recharged and renewed. I have a Tarot card with the image of a woman in a room, shutting the door to be able to catch some solitude. Taking the time to be with oneself and closing out the world and all that busyness is a wonderful ritual. You are creating sacred space for yourself and having water be part of this time is wonderful. Bathing rituals are a global practice. and are part of many different religious beliefs. In India many Hindus make a pilgrimage to the Ganges River to bathe in its waters to cleanse away all their sins. In the Christian faith Baptism cleanses the spirit. 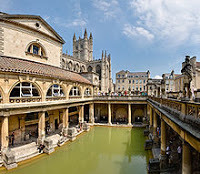 This picture is a Roman Bath that is in the city of Bath in England, I visited it in 2009 and it is as grand as the picture. The Romans tool the ritual of bathing very seriously. In the US and other countries like Greenland there are many hot spring resorts where balneotherapy reigns with spring fed mineral waters claim healing powers for the body. I know the power of the healing waters in my tub when I take the time out to create my sacred space and my ritual to slow down and immerse myself in my self. For me, these are Ritual Waters – where all things wild and waterfilled are good for the soul! When was the last time you took time for your self? Have you ever seen an Avocado Flower ? What does water and relaxation have in common?